John Picking was born in Lancashire in 1939 and he showed an aptitude for painting at an early age. After successful studies at Wigan School of Art, where he obtained the National Diploma in Design, Governors’ Medal and Travelling Scholarship to Paris, he went to Edinburgh College of Art to study painting. He won various awards there including the Sketch Club Prize and a major Andrew Grant Travelling Scholarship which allowed him to paint in Spain for a year. 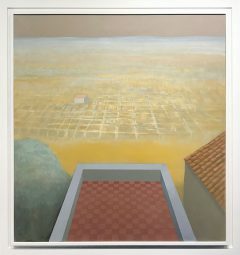 After teaching at Wigan School of Art and studies at London University leading to research work, John Picking made his first journey to Italy in 1969 and then spent various periods dividing his time between teaching at Manchester Polytechnic and other schools of art and painting in Sicily. In 1980 he left Britain to live in Italy permanently and since that date he has been working as a full-time artist. His achievements in painting and his relationship with Sicily were recognised in a documentary film entitled Il Nostro John Picking produced by Lancastria Television for ITV2. His work inspired by the island obtained recognition when he was made honorary citizen of Militello Rosmarino. He later opened a second studio near the Lake Iseo, dividing his time painting between Sicily and Lombardy. In 2001 he was sponsored to work in a studio in W 15th Street New York preparing work for the Monique Goldstrom Gallery, Broadway. His works can be seen in many public and private collections both in Italy, Britain and abroad.